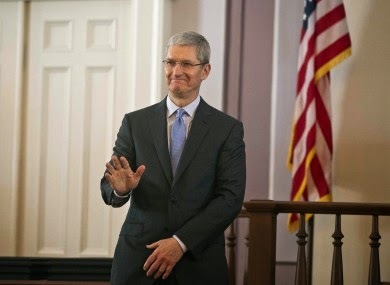 Apple bossman Tim Cook has come out as gay and has vowed to spend the rest of his life helping to "pave the sunlit path" towards equality and justice. Up until now, Cook's sexuality wasn't so much a secret as an unmentioned truth. He has frequently joined Pride marches and spoken openly about the mistreatment faced by gay people and he has always firmly and clearly pinned the rainbow flag to his lapel. But this is the first time the privacy-conscious boss has openly discussed his sexuality, which he said he considered to be one of "the greatest gifts God has given me". "I don’t consider myself an activist, but I realize how much I’ve benefited from the sacrifice of others," Cook wrote in an open letter published in Bloomberg. "So if hearing that the CEO of Apple is gay can help someone struggling to come to terms with who he or she is, or bring comfort to anyone who feels alone, or inspire people to insist on their equality, then it’s worth the trade-off with my own privacy." The Apple CEO said he was proud of his company's promotion of equality in all its forms. "The company I am so fortunate to lead has long advocated for human rights and equality for all," he added. "We’ve taken a strong stand in support of a workplace equality bill before Congress, just as we stood for marriage equality in our home state of California. And we spoke up in Arizona when that state’s legislature passed a discriminatory bill targeting the gay community. "We’ll continue to fight for our values, and I believe that any CEO of this incredible company, regardless of race, gender, or sexual orientation, would do the same." Cook has managed to dodge any excessive scrutiny of his personal life, although his sexuality has always been a talking point.